SATA is showing Toronto - Lisbon, Portugal (LIS) flights for $474 CAD roundtrip including taxes between November 2015 and February 2016. The flights are non-stop each way. Update @ 4:11 PM EST - There have been multiple reports coming in that Airfare.com is unable to actually book these for the quoted price. OneTravel is also showing them, for about $20 more. Could be worth trying, although they both might be having the same issue. Update 2 - Sep 26 @ 3:38 PM EST - Booking site FareGeek.com is also showing these fares now (slightly cheaper actually, at $454 CAD). FareGeek is known for displaying prices that can't always be booked however. Update 3 - Sep 28 @ 11:24 AM EST - Have received confirmation from people that FareGeek has been able to issue their tickets for this deal. Update 4 - Oct 1 @ 11:00AM EST - These are now showing up for $458 to $478 CAD roundtrip including taxes on most major booking sites, including Flight Network, Expedia and Travelocity. They seem to be about $50 higher on SATA's own website. The fare rules show that 1 piece of checked luggage is included (always something to watch for with SATA, because they have a fare class where no luggage is included). 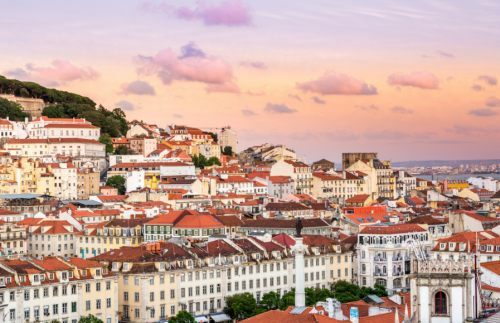 The following AirBNB link will lead you to some great deals on places to stay in Lisbon for under $79 CAD/night for 2 people. 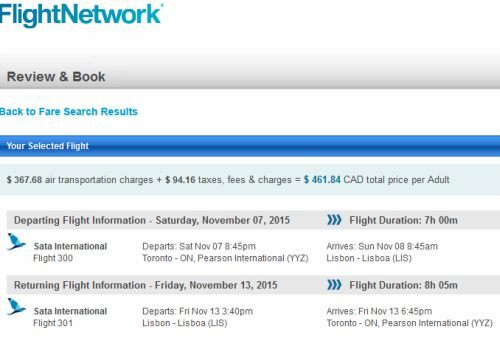 7 Responses to "Toronto to Lisbon, Portugal - $474 CAD roundtrip including taxes | non-stop flights"
Its a no-go. I tried Jan23-29 and its 840$, bummer! I was able to book it with onetravel.com. I was skeptical and thought it wouldn't work but I received the confirmation email and called the airline (SATA) to confirm. We received the e-tickets from the airline so I think we are safe. The e-tickets from the airline show a fare of CAD $680 whereas we pay way less when booking with onetravel.com, how is that possible? Hopefully it's not a SCAM. The other thing is that we have to pay to get a seat, onetravel.com offered for $20 USD and Sata is $25 CAD per person and per route. There is no seat assigned to our e-ticket. Anyone familiar with this website? OneTravel is a well known third party booking site. They are ranked #12 in the Third Party Booking Site rankings. Thanks for letting us know your e-tickets were issued. Have also heard of ticket number confirmations received from people that booked through FareGeek. Just booked this on Expedia for $477 for those of you still following this. SATA charges $200 for a checked bag each way, but expedia is showing the flights for 478.59 taxes included! Booked on FareGeek, screen shot showing C$453. Posted to my credit card as $681.